The males are coloured green, blue and yellow, whereas, the females are coloured bright red and purple. Their diet covers varieties of seeds, nuts, berries, fruits, leaf buds, blossoms, and nectar. 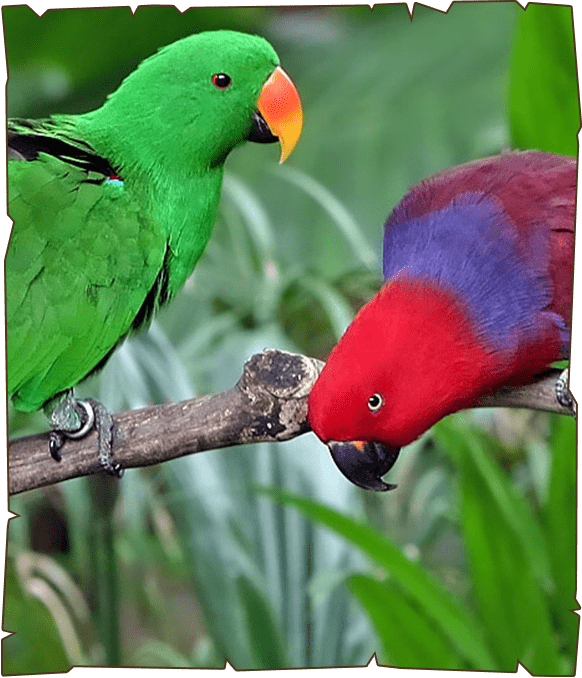 The Eclectus parrots are known to live in small flocks or pairs. Their life-span is up to about 30 to 40 years. This species display visible light sexual dimorphism, which means that the males are coloured differently and noticeably from the females. During the day, they flock to a feeding site with the size of flocks which gather there being determined by how many fruit trees are available. At night, they may roost in groups of up to 80.